by Amira Hass 17 July 2018 Haaretz. If you want a tour of the Israeli subconscious, follow Route 60 through the West Bank to the junction of the villages of Beitin, Dir Dibwan and Burqa, then turn left. You’re not familiar with that intersection? 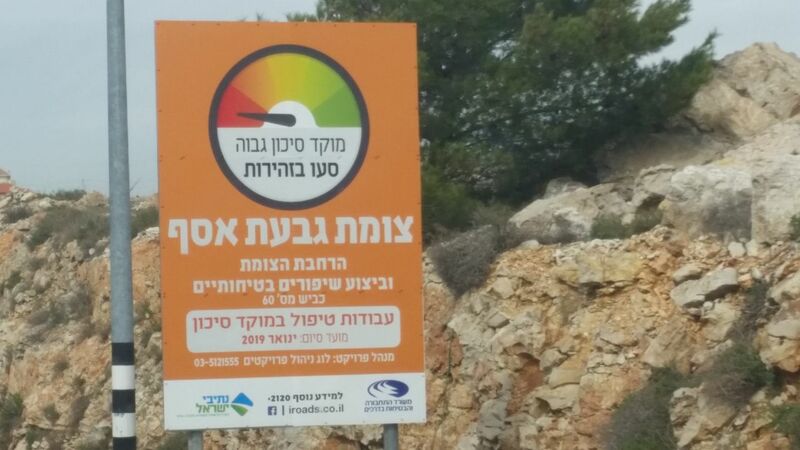 Here’s a hint: Netivei Israel, the National Transport Infrastructure Company, is upgrading the junction and has even posted signs there with the following wording: “Very dangerous site. Drive carefully.” The warnings are written inside a circle with a needle pointing to a red stripe, for emphasis. Underneath the circle, it says, “Givat Assaf Junction. Widening the intersection and making safety upgrades. Working to fix a dangerous intersection. Date of completion: January 2019.” The notice is signed by the Transportation Ministry and the roads company. In mid-March, I asked spokespeople at Netivei Israel why it chose that name for the intersection, given that Givat Assaf is, as I put it, “An unauthorized and illegal outpost built on privately owned land belonging to residents of the Palestinian village of Beitin. Moreover, this land was taken over by means of forged documents.” The outpost was built in 2001 by exploiting the severe restrictions the army had imposed on Palestinian movement at that time, which enabled settler gangs of robbers to take over more land. I added that I’d been informed the outpost hadn’t been legalized. In other words, that Israeli authorities couldn’t find any cunning legal wizardry with which to whitewash this blatant forgery, which included the “sale” of the land in 2002 or 2003 by a Beitin resident who died in 1995. “Isn’t the choice of this name a form of encouragement for real estate crime?” I asked the company. It doesn’t get involved in political issues? There’s nothing more political than a state-owned company that built a major road on lands belonging to the Palestinian villages of Beitin, Burqa and Dir Dibwan, without even giving them direct access to the road and the intersection. There’s nothing more political than a company paving roads beyond the state’s borders to enable Jewish Israelis to violate international law, which forbids transferring members of an occupying population into occupied territory. But all this is still within the bounds of the Israeli conscious. Israel doesn’t hide its goal: formal, complete seizure of over 60 percent of the West Bank. Israel doesn’t hide its position that every bit of land on which a Jew lays his hand is sanctified to him and belongs to Israel. The public? In the three Palestinian villages noted above – along with nearby villages like Mukhmas, Ein Yabrud, Yabrud and Silwad, and of course in cities like Ramallah and El Bireh – the public knows this junction to be the intersection of the villages of Beitin, Burqa and Dir Dibwan. Moreover, the Palestinian public that resides in this area and travels its roads is much larger than the public living in the nearby outposts and settlements. But the signs remain just as they were. In the Israeli consciousness, Palestinians are happenstance people who have no rights in the place where they live. In the Israeli subconscious, as reflected by this Hebrew-language sign and the explanation for it, the Palestinians have completely disappeared from this place. They don’t exist.